Before the official I.A.U. 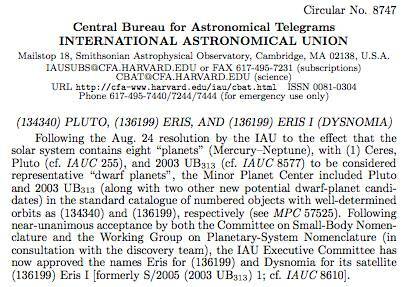 announcement, planetary astronomers knew Eris as the more uninspiring and clinically sounding provisional name, 2003 UB313. Officially, the International Astronomical Union (I.A.U.) first proclaimed the name Eris on 13th September 2006 in Circular No. 8747. This was made only several weeks after the I.A.U. Naming Committee had finally decided on the new controversial but important definition of planetary bodies — placing Eris as the new category of so-called dwarf planets. This latest sub-planet category presently includes the first minor planet discovered, Ceres, and the now denounced planet of Pluto found by Charles Tombaugh on 18th February 1930. All these three dwarf planets are now to be given similar designations as customarily used for all the known asteroids — namely, (1) Ceres, (134340) Pluto and (136199) Eris — the bracketed value being the ordered sequential asteroid number determined by discovery date. Other dwarf planets in the near future may follow, including the so-far unnamed trans-Neptunian objects or TNO’s — the brightest being 2005 FY9 and possibly the ellipsoidal-shaped 2003 EL61. From atop Mount Palomar Observatory in the United States, the team of Michael Brown, Chad Trujillo and David Rabinowitz found little Eris on 05th January 2005. Using the 1.2-metre “Samuel Oschin” Reflector, the new discovery occurred after carefully inspecting four different deep CCD images taken earlier on the night of 21st October 2003. This among Brown’s thirteen (13) major trans-Neptunian discoveries (to date) during their routine search program of images, with Eris and its small moon Dysnomia (Eris I) being the latest of their major discoveries. After some additional confirming images, and some more detailed investigations, they searched for earlier positions of Eris using past image plates. This finally roughly established the orbital parameters, whose average distance lies some 1.7 times further than Pluto does. Amid some real controversy, these observers had to prematurely announce the discovery on 29th July 2005 — seemingly fearful that another rival Spanish team of planetary astronomers were likely to publish before them. This mirrors the very “cut-throat” world of astronomy now often quoted as “publish or perish” among various rival groups of astronomers. Further exacerbating the issue, just weeks before the final “official” declaration, some of the important information of the new planetary body was accidentally released onto the Internet. For a short while, most astronomers remained unsure about the planetary nature or essential features of Eris. This was mainly because of its considerable distance from the Sun, its faintness and very slow movement against the background stars. At first, probably with some justification, some considered Eris as the long awaited new 10th planet. The simple argument was; If Pluto was to be considered as a planet, then surely this new body was also large enough to be classed the same! The real possibility of a new planet caught the attention of the I.A.U. astronomers, the worldwide media to even school children. These real passions and hopes were then somewhat diminished when the new definition of dwarf planet or Scattered Disk Object (SDO) was finally announced by the I.A.U on 24th August 2006. The worst change however was that now the official number of recognised planets, Mercury to Neptune, was now reduced to only eight planets — thus removing Pluto after its seventy-six year long reign. The King of the Underworld had been finally been usurped by a rebellious and feeble bunch of renegade astronomers! In the days that followed, the astronomical world went from defiant outrage, but then soon quickly sank into just another consumable historical passé news story. Eris, with Ceres, Pluto and Makemake, were to be considered from then on as smaller dwarf planets — to be possibly joined by other trans-Neptunian objects in the coming years.